How Visual Physics is a better way of learning? Visual Physics combines the power of visualisation with top level teaching methodology which makes learning easier and faster. Following is one of the toughest question asked in JEE Advanced 2016 related to rotational motion; and many experts have recommended to leave the question. However we don’t think so. This question just uses the basics of Angular Momentum for a rigid body and can be solved in 3-4 min of time; (only if you have really got the concepts). Two thin circular discs of mass 'm' and '4m', having radii of 'a' and '2a', respectively , are rigidly fixed by a massless, rigid rod of length 'l = √24 a' through their centers. This assembly is laid on a firm and flat surface, and set rolling without slipping on the surface so that the angular speed about the axis of the rod is 'ω'. The angular momentum of the entire assembly about the point 'O' is L.
Which of the following statement (s) is (are) true ? (A) The magnitude of the z-component of L is 55ma2ω. (B) The magnitude of angular momentum of the assembly about its centre of mass is 17⁄2ma2ω. 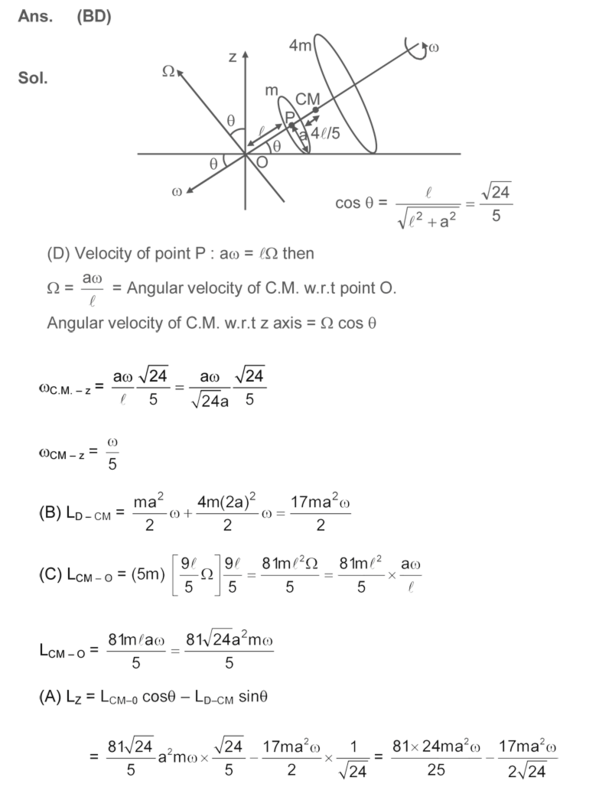 (C) The magnitude of angular momentum of centre of mass of the assembly about the point O is 81ma2ω. (D) The centre of mass of the assembly rotates about the z-axis with an angular speed of ω⁄5. Let's see, how you can learn to solve this question with different methods; and you can decide for yourself that which medium serves you best. This is a solution provided by Resonance, Kota. How do we explain solutions in Visual Physics? Visualization makes learning 25-times more effective. You can learn 5-times better in 1⁄5th of time with Visual Physics as compared to conventional methods. to experience the powerful Learning.